What is the Jenny Craig Program? Founded in 1983 in Melbourne, we are one of the largest assisted weight management companies in the world. We offer you unparalleled support – with your own personal weight loss Consultant assigned to you, who will be there with you every week throughout your entire journey. We plan (and provide) your meals to suit your lifestyle, with snacks through the day so you don’t go hungry. We help you develop a healthy lifestyle and when you’re near your goal we get you cooking some of your own favourite recipes. Once you reach your goal weight, we will teach you the skills to plan your own days using all your own foods, to maintain your weight and new healthy lifestyle. With over 100 centres across Australia and New Zealand, we are bound to have a Centre close to you. We also offer a convenient home delivery option from many of our centres, with weekly consultations over the phone if that works for you and your lifestyle. How was the Jenny Craig Program developed? Our program was designed more than 30 years ago by Accredited Practising Dietitians in Australia and Registered Dietitians in the US, in consultation with our expert International Scientific Advisory Board comprised of leaders in their field of scientific expertise covering medicine, nutrition, exercise and psychology. Today, these experts continue to provide guidance on educational and lifestyle strategies to enhance our members’ success with developing healthy habits and managing lifestyle change. It’s through this that we ensure the Jenny Craig program is in line with current scientific evidence and reflects best practice in weight management. What will Jenny Craig teach me? 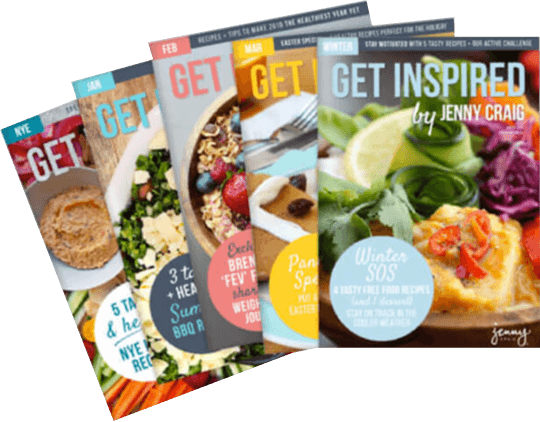 Jenny Craig will teach you healthy habits around the 3 key success factors: food, body and mind, to help you lose weight and keep it off! We all love food so we’re not going to stop you eating what you love. We’ll teach you sensible eating habits around portion control and how to eat mindfully. To get you started, we do the hard work and provide you with a kilojoule controlled menu and delicious prepared meals and snacks. We encourage members to gradually increase activity through a combination of natural, planned and “playful” physical activities. We provide tips and strategies to build an active lifestyle to suit your individual preferences. Jenny Craig emphasises cognitive strategies to help you develop a more balanced, positive mindset. The program uses a self-efficacy model as a foundation for behavioural change and is designed to develop members’ skills in self-monitoring, goal setting and problem solving. How long will I need to stay on Jenny Craig? How long you stay on the program depends on your own personal goals including how much weight you’d like to lose. We have membership options to fit your needs and will support you until you reach your goal. We also have the Maintenance component of our VIP Membership that is there to support you after you reach your goal weight, to help you learn the skills essential to maintaining your new healthy habits and behaviours in the long term. Whether you’d like to lose a small amount of weight for a special occasion such as a wedding or reunion, or want to make more significant changes, Jenny Craig has options to meet your needs. Our program has been designed to result in a healthy weekly weight loss of ½ – 1 kilogram (less for breastfeeding women and adolescents). These results may vary based on personal weight history, body composition, frequency of physical activity and personal motivation, among other factors. What happens when I first go into a Centre? This consultation is obligation-free. No matter what you decide, you’ll leave the Centre feeling even more motivated to take action towards a healthier lifestyle! How do my weekly consultations work? Each week, you’ll speak with your personal Consultant for a 20-minute, private consultation whether in centre or over the phone, whichever suits you. Your consultant will help you where you need it most, be it monitoring your weight loss progress, encouraging you to set personal goals, celebrating success or providing strategies to handle challenging situations such as dining out, travelling and unplanned changes. They will also help you select satisfying and convenient weekly menus that fit into your lifestyle. Do I have to have a weekly consultation? Our weekly consultations play a major role in our clients’ successes. Not only do we want to support you along your weight loss journey, we want to ensure that you’re experiencing a healthy rate of weight loss. However if you find yourself too busy to visit our centres in person, we recommend you ask your consultant to conduct these consultation over the phone and have your food delivered to your door. Do the menus include only Jenny Craig food? To start with, you’ll enjoy 3 Jenny Craig meals and 1 Jenny Craig snack every day, combined with your own fresh fruit, vegetables, reduced fat dairy products, wholegrains, lean meats or alternatives, and healthy fats. As you reach your halfway point on your weight loss journey, you will start introducing your own foods and recipes – so that by the time you’re at your goal weight, you are eating your own food – prepared by you! That way there is no reliance on Jenny Craig to maintain your weight – you’ll be doing it on your own! Will the Program help me keep the weight off in the long term? Yes, at Jenny Craig our goal is to help you learn not only how to lose weight, but how to effectively maintain your weight loss as well. The maintenance component of our VIP Membership helps transition you from the Jenny Craig menus to planning and creating your own healthy, nutritionally balanced meals. Our VIP Members have the continued support of a personal Consultant who will guide you through the maintenance support materials to help you master the skills essential for continued success. How do I know which Membership Option is best for me? We have membership options available to suit any lifestyle and weight loss goal. Your Consultant will help you determine which membership would best suit your needs. How can I find my nearest Centre? With over 100 centres across Australia and New Zealand, we are bound to have a location convenient to your needs. Find a list of our centre locations here or you can also call 13 19 92 and you’ll be transferred directly to your nearest centre. Don’t forget we offer convenient home delivery option in many areas – call your local centre to find out if we service your home or office. What if I don’t want to go to a Centre … or there’s not one in my area? We encourage you to attend your weekly face-to-face consultations for the best weight loss results. But we also offer Jenny Craig At Home, where you can meet your consultant over the phone anywhere and have your Jenny Craig meals delivered to you. Too easy! Ask your nearest centre for details. The cost of Jenny Craig depends on several things – which plan you choose, which meals and snacks you select, which payment options you choose and so on. You will start on our planned menus which have been designed by our team of Accredited Practising Dietitians, consisting of our tasty meals for breakfast, lunch, dinner and snacks which you combine with fresh fruit, vegetables, lean meats or alternatives, whole grains and reduced fat dairy foods. As you progress through your weight loss journey, your Consultant will provide you with knowledge and skills to transition away from our planned menus and continue with a healthy lifestyle. View our membership page to learn more about the Jenny Craig costs. Can I do the Program if I travel a lot? The Jenny Craig program is flexible and can be altered to fit into your lifestyle. Your Consultant will be able to help you make a plan for when you travel to help you to continue to see results. Additionally, our home delivery option may be available in your area so you can have your consultations over the phone and your food is delivered directly to you (plus the cost of delivery). Contact your local Centre to find out if this option is available in your area.